Mark Machala is a chiropractic physician living and working in Ashland Oregon. 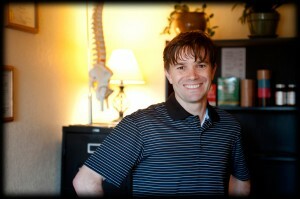 With a background originally in martial arts and massage, he synthesizes more than 20 years into his Ashland practice. I was able to speak with Dr. Machala and learn more about the interesting path and inspirations behind the services he provides to our community. Dr. Machala, thank you for doing this interview with me today. I’d like to start our conversation with your involvement in martial arts and how that weaves into your practice as a chiropractor. What was your original attraction to martial arts and what goes into participating in a practice for so many years? I started training in martial arts in 1988 in a traditional Japanese system called Danzan Ryu Jujitsu. For me, it started as a fighting technique. I was a teenager and I liked to wrestle, but I quickly realized that the study of jujitsu fulfilled something within that is difficult to describe. I felt like I had found a way to pursue an understanding of myself and where I fit in the world. I did not know this initially, but I had began training in a system that was not primarily concerned with fighting techniques, but rather the true emphasis was in using the practice to realize one’s own potential as a human being. In our original discussion you had talked about how jujitsu as a martial art also has it’s own healing system which utilizes adjustments which are very similar to chiropractic adjustments. Can you talk about the similarity between your martial arts training and the services you offer as a chiropractor? Yes, it is common for Japanese jujitsu systems to also have parallel healing arts. The system paired with Danzan Ryu Jujitsu is called Seifukujitsu. The foundation of the healing side is massage. This style of jujitsu came to the United States via Hawaii and the massage component is clearly influenced by the Hawaiian massage system called Lomi Lomi. Along with the massage, specific therapies were taught for specific ailments. There are remedies for things such as headaches, bruises, menstrual cramps or even setting broken bones. I have been told that practitioners of jujitsu in the past were known as the bone doctors because of their skill in skeletal adjusting, and resetting dislocations and fractures of bones. My teacher would often end classes with training in massage, and in the early years, I would observe him teaching the black belts how to adjust everything from spines to elbows, knees and toes. Eventually, when I earned my black belt, skeletal adjustments were no longer part of the Seifukujitsu training. In order to continue my path, the obvious direction was to become a chiropractor. I was a massage therapist for 12 years and today in my chiropractic practice I still use the the massage techniques I learned in those classes. I find it extremely effective to massage before doing any adjusting. In fact, I often find it no longer necessary to adjust the bones after massage. On the phone you said to me that the more you practice martial arts the better you get at chiropractic, and as a chiropractor, you improve in martial arts. Can you talk about this relationship? In both the martial arts and healing arts, an intimate understanding of the human body is vital. Whether for combat or for healing, every system approaches the body from a different angle and provides a distinct insights and understanding. The Jujitsu system uses joint locks and leverage, and chiropractic is concerned with alignment of the bones which occurs at the joints. In my mind they are the perfect compliment. You mentioned that you have started a new martial art at white belt level. Tell us about your current training. With two small children and a chiropractic business, I still manage to devote some time every week to martial arts. In Ashland, I am able to incorporate a collage of different styles. Steve Glaser offers a similar style called Hako Ryu Jujitsu and I really enjoy Capoeira, a Brazilian martial art with a local instructor Paulino Arteaga. Wing Chun and Chi Gong are also part of my training. What techniques do you bring to your chiropractic office and what would a typical session be like for a patient? In addition to skeletal adjustments, I incorporate a lot of massage in my practice. Also for those patients that are interested, I teach exercises that they can do at home. For exercises I draw both from the western physical therapy model as well as the eastern systems such as yoga, chi gong and the various martial art forms I have studied. You have been working with members of the SOU Track & Field team who have recently competed on the national level. What has this process been like for you? I have really enjoyed working with the SOU athletes. They are motivated and driven people. For anyone who comes to my office, I want to take them to a higher level of functioning. With athletes they are already functioning at a high level so it is an enjoyable challenge to help them get to greater levels. How do you work with patients to meet their own health goals? Every person comes in with different goals. My first step is to learn what each patient wants from our relationship. Some patients simply want to get out of pain, others might want to increase their flexibility so they can garden or golf again. In some cases, it might take just one visit, in other cases we may set up a treatment plan that includes a series of visits over the course of a week or a month. Many people call me on an ‘as needed’ basis. I view every patient as an individual and their treatment is customized to their particular needs and goals. I do not follow a model that requires repeat visits, rather I truly focus on empowering people so they learn how to care for themselves. Do you always have to have aches and pains to come in? While pain is the most common motivator for someone to seek chiropractic care, it certainly is not the only reason. In some cases people come to improve abilities in sports or simply to maintain a healthy lifestyle. Yes, I’m in network with all the major insurance companies and I even take Medicare. You will be doing an upcoming lecture at the Co-op will you tell us more about this? The title of the talk is Stretch, Strengthen and Posture. It will be on June 20th at 7pm in the Ashland food Co-op Community Classroom. In the class, I will discuss the difference of slow twitch and fast twitch muscles, why one tends to get tight and the other weak and how that effects posture. The focus of the class will be to teach people simple stretches for the muscles that are tight in most of us and ways of strengthening the muscles that tend to get weak, which is very effective for low back pain. The class is free, and it is a great way for anyone to get to know me and the perspective I take in healing of the human body. Any last words or comments you would like to share with our readers? I moved to Ashland two years ago and I absolutely love this community. I am looking forward to raising my children here and many years of service to health and wellness.